It is with great pleasure that I announce that international bonsai master Walter Pall will be at the Chicago Botanic Garden, performing a demonstration on the collection’s oldest tree. Bonsai master Walter Pall contemplates his work. Pall has performed on many international stages, and is one of the world’s most popular bonsai artists. He has visited the vast majority of European countries as well as South Africa, Australia, Canada, Israel, Argentina, Brazil, and the United States. His lectures are a treat. Pall’s philosophy about bonsai demonstrations is first and foremost to provide a basis for high-quality bonsai work. He adds a substantial amount of explanation so that the audience can clearly understand his development process, and he tells amusing anecdotes along the way. Please join us for Pall’s demonstration on Wednesday, April 13, from 6 to 9 p.m. Find additional information about Pall and see pictures of his amazing trees and work on his website at www.walter-pall.de. 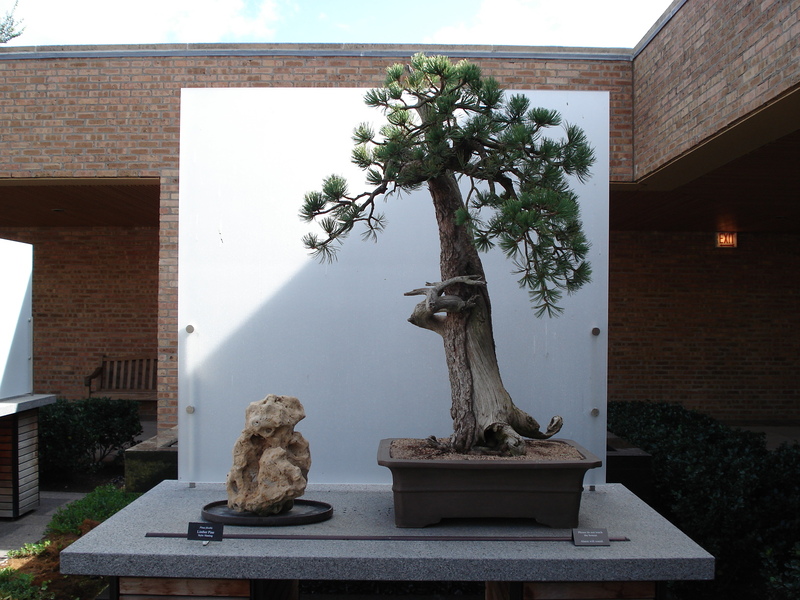 Pall will work on a limber pine (Pinus flexilis) that was donated by Gerald Weiner in 2007. This tree was collected in Estes Park, Colorado, at about 10,000 feet in the early 1980s by Harold Sasaki, and is estimated to be around 800 years old. Though he initially was looking for landscape material, Weiner could not resist purchasing this tree for a bonsai in 1987 on a collecting trip to the Rocky Mountains. This is the largest and oldest tree in the Chicago Botanic Garden’s collection, and it is an absolute honor to have Walter Pall come and work on it. This is a must-see event! Chris–enjoy your bonsai articles. I’ve been a member of the botanic gardens for many years and have been a bonsai enthusiast for many more. I attend all of the bonsai presentations and have purchased many a ‘pre-bonsai’. Every time I come I always visit the bonsai open to the public in the two courtyards. My question is: there are so many bonsai that are not available for viewing–stored in some facilities not open to the public. I would be extremely interested in ‘touring’ those facilities and viewing the myriad bonsai not available to the public. I’m sure many bonsai enthusiasts would share that interest. While the conditions are not possibly ideal, it would be extremely interesting for us. Any thoughts on creating a ‘tour’ or open house even if it required a fee? Thank you.